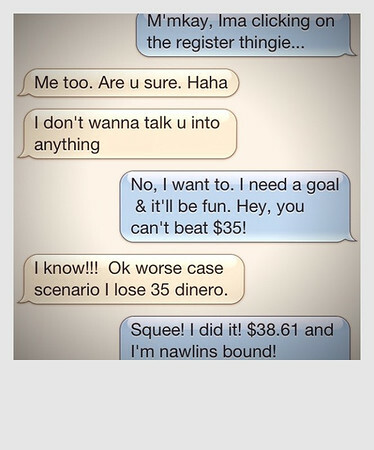 Ever wonder what can happen when two friends start texting? It's been far too long since my last race and I really, really, really am the type of slacker that needs a goal, and a goal with $$ on the line is even better. The Rock and Roll Half normally costs $90, which is kind of ridunkulous anyway, but since the Saints won their recent football game they offered a discount of a dollar off for every point scored, so by entering a special code we saved a whopping $55!! That in itself made me giddy. But then I remembered I'll have to, you know, actually train for this and, like, run regularly and stuff*. That in itself made me pause. So, my friends, let this serve as a cautionary tale to spontaneous texting. P. S. Like re-re-re-commit to cross training with things like P90X. Ay, yi, yi. I started Tuesday with Chest & Back and can not fully straighten either of my arms ever since thanks to all the push-ups and pull-ups. Starting over is hard, good but hard. Thanks Anne! 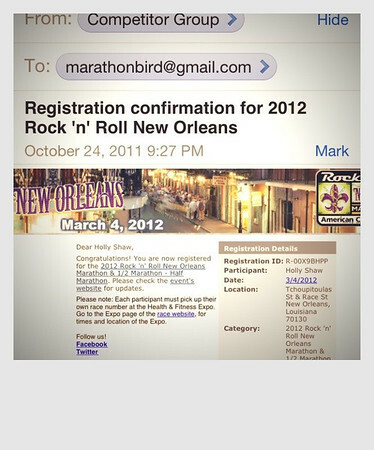 I'm excited to run (wog) through the streets of New Orleans. And it's one more state on my somewhat dormant goal list of running at least a half in each state--this will make four--if you count D.C. as one :) Ha! Yay - my cousins are going to be running in that half, too! Fun! Should be easy course since so flat here. When March gets closer email me if you want to meet up for a latte in New Orleans or if Annelise is with you we could do something like the aquarium or insectarium etc with the kids. Charlton: Thanks, girl! I never thought I'd *be* a runner, but discovered my inner runner girl in my late-30s. We can do it! ...right?? Are we crazy? Good for you! I have to do the same in order to push myself. But I always wait until the last minute to register..just in case I'm not as ready as I think I should be..ha ha!